In the summer of 2016, marine biologists assessed the planet’s largest coral reef, Australia’s Great Barrier Reef, which is 25 percent longer than the length of the Philippines. What they found was alarming: Up to 93 percent of the giant reef system was bleached! Coral bleaching happens when water temperature gets too hot for a month or two, forcing corals to expel the symbiotic algae which give them both color and sustenance. 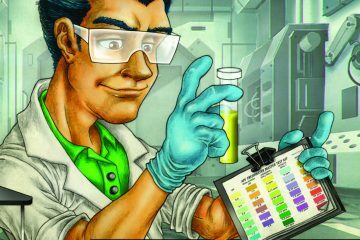 Corals are animals that “farm” plants in the form of microscopic algae called zooxanthellae and zoochlorellae. These inhabit coral tissues and generate 90 percent of the coral’s food through photosynthesis. When the algae are expelled, corals usually die of starvation. Scientists predict that unless climate change is stopped this generation, then most coral reefs may disappear by 2100. 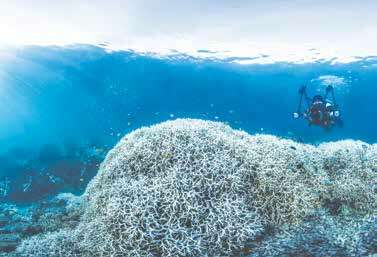 A 2016 study by Scott F. Heron and team published in Scientific Reports warns that by 2050, over 98 percent of the world’s shallow-water reefs will be affected by massive coral bleaching episodes every year until they either adapt or die. This is sobering new for those of us who love the sea, but the big blue harbors many secrets, including a slice of the ocean which we’re only now beginning to understand. Found at depths ranging from 100 to over 400 feet — beyond the reach of most SCUBA divers — mesophotic reefs thrive under little illumination to earn their nickname: twilight reefs. The Great Barrier Reef endured at least seven bleaching events this century, with the three most destructive happening since 1998 — but the 2016 event was simply catastrophic. “It was like 10 cyclones battered the reef all at once,” said Prof. Terry Hughes of Australia’s National Coral Bleaching Taskforce. 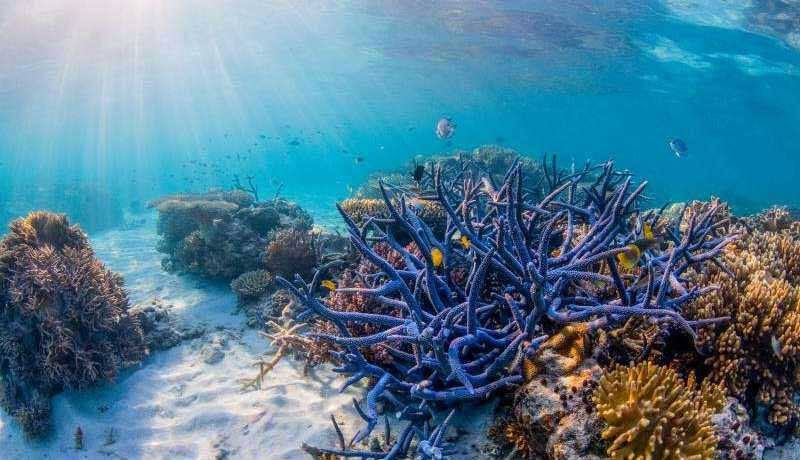 Since then, about a third of all the reef’s corals have died, reported Hughes and colleagues in a 2018 study published in the multidisciplinary science journal Nature. This is a major blow and the most serious indication that the world’s shallow-water coral reefs are, quite literally, in hot water. The culprit is again manmade climate change, spurred by greenhouse gas emissions from burning fossil-fuels, coupled with intensive agriculture. “Meso” means middle while “photic” refers to light. Hence, they are found in the “twilight zone” — the middle zone between the ocean’s brightly-lit surface and its darkest depths. These sprawling complexes lie all over the world, 100 to 400 feet beneath the blue. Serving as important habitats for economically and ecologically valuable species like bluefin tuna, these habitats are a potential refuge for many types of life as the cool water shields many animals from warming temperatures. Depth also protects them from coastal overfishing and storm surges. Scientists have realized that twilight reefs are potential sources to reseed and revive shallow-water reefs if they fail to adapt to climate change. These reefs, providing opportunities for the management and restoration of the world’s seas, just might give our seas a second chance. Very little was known of the ocean until the development of reliable SCUBA diving gear in the 1950s. Since then, divers explored the world’s seas but have always been limited by depth. The deepest a typical diver can go is about 100 feet, whereas the average depth of the ocean is 12,000 feet. Fortunately, new technologies like GoPro cameras, pressurized housing systems, and remotely-operated-vehicles (ROVs) are allowing scientists to really see what lies beyond the first 100 feet of our oceans. What they’ve found is simply astounding: mesophotic coral reefs growing in cold water with little light. Though we know that many types of deep-sea corals thrive without light, these new reefs are teeming with almost the same kinds of life — corals, fish, and even seaweed — that live in shallow-water reefs like the Great Barrier Reef. As the world’s second-largest archipelago, it comes as no surprise that we have our own set of twilight reefs, the most famous of which is Benham Rise. Originally named by surveyors in honor of American Admiral Andrew Ellicot Kennedy Benham, the Philippine Rise (renamed by Pres. 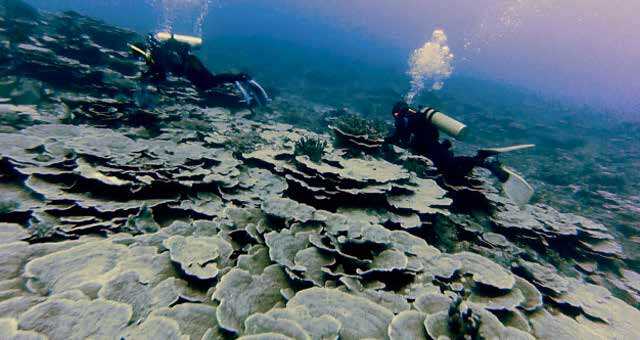 Duterte in 2017) is an immense deep-sea coral reef system which lies east of Luzon. It occupies 24.4 million hectares, almost as large as the land area of the country. Its shallowest part is Benham Bank, which is about 130 feet deep. Scientists found at least 170 fish species – including fearsome tiger sharks and powerful tuna. Just as interestingly, cactus-like seaweed like Halimeda were found thriving in very low-light. 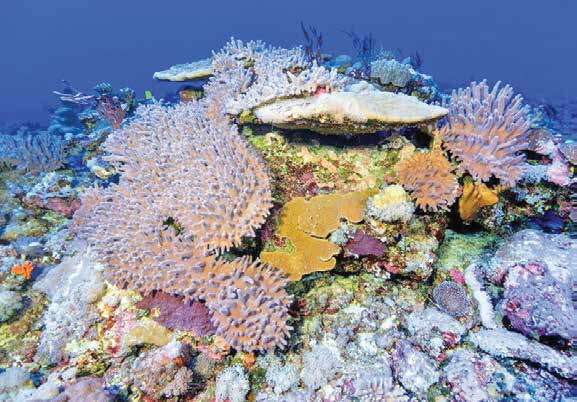 The value of the Benham Rise is incalculable, since it is our reefs’ surest safety net for climate change. Unfortunately, miners and the Chinese government are already eyeing it. In 2017, Chinese survey vessels were found mapping the area, with possible plans of exploiting its resources or considering its military value. “Still pristine, the Philippine Rise harbors a variety of healthy marine wildlife populations, including sharks, rays, dolphins, whales, and marine turtles. With much of the inner Philippine Seas disturbed, overfished, and polluted, the Philippine Rise is a sanctuary for these threatened species. Anything we do there should not be detrimental to the existence of its marine wildlife populations,” noted Marine Wildlife Watch of the Philippines Director AA Yaptinchay.